"How many more days 'til Christmas?" "I wish Christmas would come faster." Every parent has heard these words many more times than they care to remember. After all work, parties, and, for Christians, Advent help adults count down the days to Christmas. Children, however, need a more visual way to count down to Christmas. Advent calendars trace their origins to Protestants of 19th century Germany. The first calendars were just chalk marks made on or small pictures tacked to a wall or door. Some families used Advent clocks, a wooden structure with 24 candles, to mark the passing of each December day. 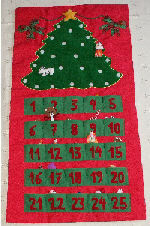 The first handmade Advent calendar was made in 1851. The date of the first printed calendar, however, is not known. According to the Austrian Landesmuseum the first calendar was produced in Hamburg, Germany in 1902 or 1903. Others say that the accolades should go to a German newspaper, Neues Tagblatt Stuttgart, who inserted an advent calendar into their paper as a gift to their readers. Still others say that the first printed calendar was produced in Germany by Gerhard Lang in 1908. Lang's calendar did not have windows. It was just a number of colored pictures that were attached to a piece of cardboard, 1 picture per day. It was modeled after an advent calendar that Gerhard's mother made for him many times as a young boy using pieces of candy instead of pictures. On each day of December leading up to Christmas, Gerhard ate a piece of candy. Windowed calendars appeared in 1908. Chocolate candies were later added to encourage children to use advent calendars. During World War 2 advent calendars were not produced due to a shortage of cardboard. In 1946 calendars were once again printed in Germany. Richard Sellmer started a company that has produced a million different advent calendar designs. The first calendar was called "The Little Town." It was a handmade calendar that pictured many town buildings. The windows of the buildings opened to reveal "nice things." He also produced a lamp shade calendar. It fit any lamp and revolved under heat. It also had 24 windows to open. For the singers, Sellmer produced a carols calendar with a carol to be sung each day of Advent. In 1954, a White House calendar was produced with scenes of the White House in Washington, D.C. Many advent calendars were sold in drugstores all over the United States. Their popularity in the U.S. soared in the late 1950s - 1960s. Now there are many types and themes of advent calendars. There are religious themed calendars with pictures of Mary and Joseph traveling to the stable, nativity scenes, church scenes, and pictures of Bethlehem. There are also calendars printed with pictures of winter wonderlands, Santa Claus and his workshop, snowmen, and many more some filled with chocolate candies. Non-paper advent calendars have also appeared. There are stocking calendars with a picture of a Christmas tree and ornaments to be hung on the tree each day. There are magnetic calendars to be put on the refrigerator and nativity calendars with pieces to be added to the creche each day until baby Jesus is added on Christmas day. There are even advent calendars on the internet. 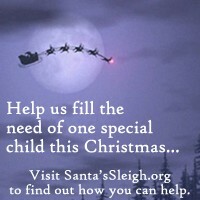 Links to sites with advent calendars are listed below. Advent calendars are a fun way for children and adults alike to look forward to Christmas day. Go out today, find a calendar you like, and buy it today. Your children will enjoy it. If you do not wish to buy an advent calendar visit CustomsOfChristmas.com's very own Cinnamon Bear advent calendar. Visit daily starting November 29 and going through Christmas Eve to hear the adventures of Jimmy and Judy and Paddy O'Cinnamon, the Cinnamon Bear, as they search for the missing silver star that belongs on the top of their Christmas tree. These web sites offer online advent calendars. Cinnamon Bear advent calendar - CustomsOfChristmas.com's very own advent calendar that starts November 29. Garfield.com - Garfield the cat sings his version of the 12 Days of Christmas starting 12 days before Christmas. Follow these directions for a fun and easy advent calendar idea to make with your kids. Give your kids 25 small boxes to decorate with paint, markers, stickers, stamps and ribbon. Write the numbers 1-25 on each box and fill with candies or small gifts. Print out a copy of the Christmas story and cut it into sections or paragraphs to glue on the inside of each box. Read through the story every night before Christmas with your kids and save to use again next year!